The St. Thomas Tommies have added their first forward recruit for the coming 2012-13 season. 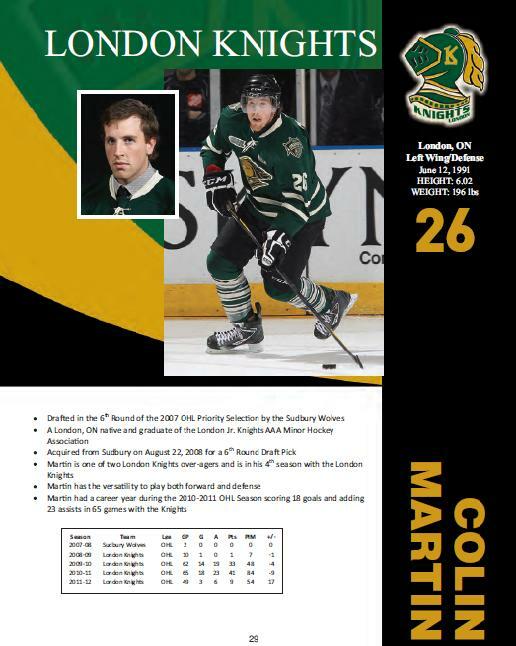 Colin Martin of the OHL Champion London Knights has confirmed via Twitter that he is the newest Tommie. Martin tweeted "Proud to officially be a part of the St. Thomas University #Freddy #Tommies". The 6'1" Martin, a London, Ontario native, has played parts of five seasons in the OHL including four with his hometown Knights. His best offensive season was last year when he recorded 18 goals and 23 assists for 41 points. Current Tommie Steve Sanza, a former Captain for London, was also on that team. This season Martin was asked to play defense, take a leadership role with the Knights and help develop a young, skillful team. Neate Sager of Yahoo Canada Sports and former CIS Blog manager, wrote a great article on Martin during the Memorial Cup. You can read it HERE. The 6-foot-2, 196-pounder grew up as a power winger, the kind who usually wore the captain's C and led his club in points and penalty minutes. The Knights were deep this year so he moved back to defence as an overage. Whatever it takes to stay, eh? "I grew up watching this team, it was my dream to win a championship with this team," Martin says. "I stuck with them right to the end." Welcome to St. Thomas Colin. Great pick up for STU. Ryan seems to be picking character guys to play for him. Colin is going to be a big pick up for St. Thomas. This kid can play big minutes, play an offensive role, defensive role, anything you need. Might be one of the biggest surprises in Atlantic university league.